It’s not always easy to explain my baby girl’s love of all things *Godspell*. People tend to look a little confused when we try to explain that yes, our second-grader is obsessed with the groundbreaking and historically controversial 1970s Broadway production and the movie that followed. Ok, maybe I don’t actually say exactly that, but close. I can tell you how it all started, though I’m not sure that it really matters anymore. It must have been three years ago now, when Katie was singing “Prepare Ye” in our church’s youth choir. Since she’d never heard the original (and I had always loved the score growing up) I picked up the cd for her so that she could get a feel for the song and its context. We began to listen to the music in the car and it soon became a family favorite. Brooke did no more than listen quietly, but back then that was something. Eventually, I happened upon the movie in Blockbuster’s bargain bin. Hey, for $4.99 I can be a sport. So I brought it home for Katie, who would watch it politely and just as quickly lose interest. I could never have predicted what would happen next. The characters may not have actually been given names in the show, but they certainly have names in our house. Early on, Brooke insisted on knowing who they were. She wouldn’t take, “They don’t really have names” for an answer. So I named Jesus, of course – that one was easy. And John the Baptist, who, in a completely confusing turn plays Judas Iscariot at the end when it comes time to betray Jesus. And I went out on a limb and told her that the one who plays the devoted temptress was Mary Magdalene. Over time, the rest of the cast (or ‘the workers’ as she calls them) became Matthew, Jeffrey, Godspell, Jessie-Lynn, Mary, the other Mary and Mary Carson. Yes, there are four characters named Mary. No, I had nothing to do with that. Also, to be clear, many of them actually have much longer handles than I’ve shared here. For example, Jessie-Lynn’s full name is apparently Jessie-Lynn Ixana Chup Chup Samaram. Listen, I don’t make this stuff up, I’m just here to report the facts. Brooke’s *iPod* is loaded with music from the show . When we go out to dinner and she needs to block out the sound, she plays the soundtrack again and again. Still not understanding that we can’t hear it too, she asks us to tell her who is singing each and every song. She knows which tracks are in the show but not the movie. She quizzes us to see if we remember. Our entire world is Godspell infused. At the pool this summer we played the *Godspell ‘Be Careful’ game* in which each character was given a dangerous task to perform and then told to be careful. 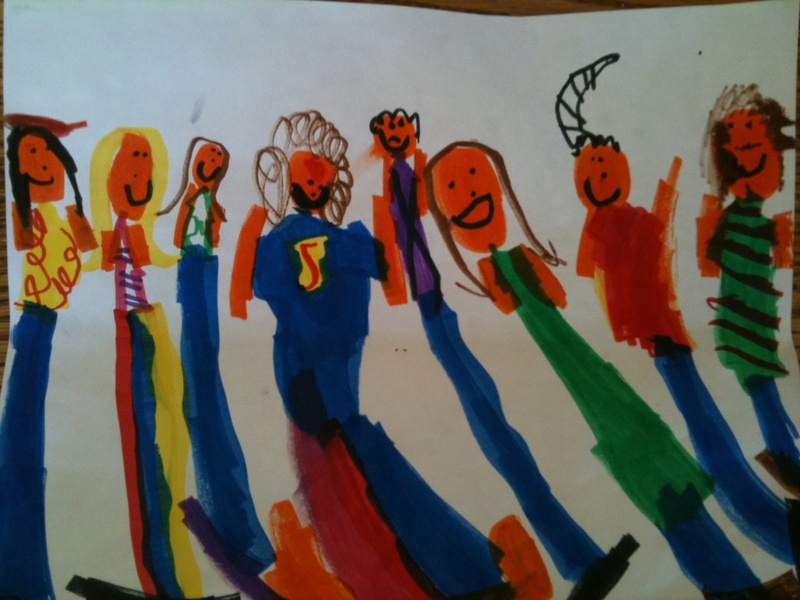 At home, Brooke draws the Godspell ‘workers’ over and over again. We have hundreds of pictures of the cast. We even have a subset of the workers in costumes – Jesus often dressed as a robot and Mary Magdalene a black cat. Whenever we’ve been away from home for a while, Brooke finds an opportune time to ask (usually quite loudly in a very quiet place) when we are ‘going home to Jesus.’ She then pantomimes a hug while declaring her intention to give Jesus a BIG hug when she gets home to him. Uh huh. This year, *just as her sister predicted*, she asked for a Mary Magdalene doll. And yes, she will get her. I’m dreading sewing on that damn hair again. Shuddup. The bottom line is, Godspell is a HUGE part of our world. I don’t really know how else to convey just how HUGE, except to say that sometimes I’m convinced it IS our world. So when I heard that a community theater not too far from where we live was doing a production of the show next month, I nearly jumped out of my skin. And when I called said theater and stuttered and tripped over my words and held back tears as I tried to explain to the lovely woman who answered the phone that my daughter has autism and that Godspell is everything to her and that we would be happy to buy tickets to a performance and well, we WILL buy tickets to a performance, but see, here’s the thing, we’re really worried about her ability to make it through the whole show – or at least to sit through it in a way that wouldn’t be disruptive to the rest of the audience because she doesn’t really understand that there’s a difference between being AT shows and being IN shows and so she likes to sing along, and for heaven’s sake this IS HER SHOW and she knows every word and every song and there’s no way she’s going to sit there without singing and pointing and happily squealing and saying things like, “That’s a DIFFERENT Jesus” and well, is there any way that maybe, just maybe, they would think about letting us come to a dress rehearsal? And then the nice lady said that she’d ask the director and the producer but she couldn’t imagine them saying no and then I finally got the answer nearly two weeks later and IT WAS YES! and suddenly it was really happening the very next day – which is actually now yesterday – and my baby was really gonna see Godspell – which she did last night. Tomorrow I will do my best to wrangle the evening into words. For today, I’m living in the space that it created. A space so much like the story itself – where the players leave their everyday lives behind and together celebrate Love, Gratitude, Faith and Joy. And though I will somehow write it all into tomorrow’s post, if I had to, I could sum it up in one word. Oh wow, best early Christmas present ever! So I’m looking forward to being a glorious soggy mess with your upcoming magical post. I am so happy for you guys! OH MY GOODNESS I can’t wait for part 2!!!!!! How dare you leave us hanging like that! I’m so glad you had a magical time. I can’t wait to hear the rest of the story!! I’m thrilled that it turned out to be every bit as wonderful and magical as you hoped it would be. I cannot even begin to imagine her excitement and yours on that very special day. I’m hoping for video!! THAT IS SO AWESOME!!!!!!!! I’m so happy for you and Brooke. She must have been over the moon. I can barely wait until tomorrow! My drama club did this play in High School, I still love the soundtrack so much. It reminds me of some great times. You do know you are an amazing mother, right? I love the lengths you go to. The Jesus Doll. It’s so perfect! I can’t wait to see Mary Magdaline! Unfortunately, my boys feel this way about the band “Muse”. I don’t think they will be having any dress rehearsals in my town soon, but I do find ways to feed the beast. Videos, posters, the usual. thank you for your incredibly kind words! and yeah, i guess muse band member dolls? not so much .. lol! And Dayam girl- you deserve this!!! So happy that you’re in the happy place right now! Kinda fitting that Thanksgiving is this week, huh? hells yeah .. and above all my girl deserved this!! we’ve got much to be thankful for this week!! I just want you to know that though I was never diagnosed with anything as a kid, I obsessed over musicals and ballets in pretty much the same way. I think it’s pretty clear what we have here. A Drama Baby is born. And how much do I love that you took her to see this?! That you have never once denied her her single most pleasure? Can’t wait for more, either! Dress Rehersal? YOU ARE A GENIUS!!! That is so brilliant, I can’t even grasp it. Way to go MOM! lol. i have my moments. hahahaha. Oh man tears again! I don’t know what part made me more emotional, the anticipation of the event or your description of being on the phone w/the theater lady. You ARE a genius. It’s going to be tough waiting until tomorrow am but this is absolutely awesome! You are an awesome mama, love it. highest compliment there is. thank you!! This is awesome, and can’t wait to hear how it turns out in Part 2 (though my suspicions). I also suspect that a lot of us could take every mention of “Godspell” and substitute it with our own child’s unique interest/obsession and not have the story change much. I know I could. I also know that it is indeed “magic” when you find that sweet spot where your entire family can relate over an interest and your child can find a space where they’re engaged, and comfortable, and really not that unlike everyone else. It is magic, indeed, and I treasure those moments, have spent lots of money pursuing more of those moments, devoted much of my free time making more of those moments. I also suspect that a lot of us could take every mention of “Godspell” and substitute it with our own child’s unique interest/obsession and not have the story change much. Jess, You are an amazing mother. Your love, devotion and acceptance of your daughter is incredible. Also, have to say that Russ, comment 21, is also an amazing father. He spends so much time and energy in making his son happy. I know this because I am married to that wonderful man and the father of my lovely little boy who stuggles so hard. susan, thank you – those world mean the world to me. and no doubt to russ – you two are just too dang cute. xo! Magic is indeed when you can join her in “her place”- where she welcomes you and recognizes you and together you share the experience. I’m so glad- for ALL of you! And first Harry Potter 7A and now this?! I’m getting seriously tested for delayed gratification! yeah for you all! I am so thrilled it all fell into place! LOVE! I admit, I’ve been DYING to know the Godspell “back-story”! Can’t wait to hear how it went, and I am so THRILLED they let you in to see a rehearsal. I’m just so glad she loves something so retro and cool! I am sitting here in AWE- and tears- over your Daughter and the lengths you go to make her happy. I am happy to know that I am not the only one who does that for there son. My child has gone through phases (video games, at age 2, Spiderman, Superman, Ironman, Video games OF spider man superman and ironman, railroad tracks, how a clock functions etc) and for each and every “phase” we have gone above and beyond to try to find that ONE thing he just HAD to have to for Christmas or his birthday. I have even made his some clothes (and Im not that talented on a sewing machine) because he cant handle the texture of certain clothing or the seams. Even though these clothes had “lumps” in them (not cut just right) he was happy and still wears the first one I made (now 2 sizes to small) out of a fleece blanket. I have learned, through my Shawn-ee Boy, that life isnt about the nice or finest things, its about being happy and having people in your life you care about you enough to go to no ends to MAKE you happy. Thanks for sharing this and giving us a glimpse of you BEAUTIFUL daughter! thank you!! your comment is beautiful and generous and wonderful. indeed, we learn so much more from these incredible human beings than we can ever hope to teach them. Godspell is one of my faves – I was in it years ago (Sang “Turn Back, O Man” – what a shock, eh?). I can’t wait to hear how it went! Our kiddos surprise us all the time, don’t they? I am overwhelmed by the Jesus doll! You really are the best mom ever! At our house it is “Barbie in a mermaid tail”. Luckily, you can buy all the toys (and grandma found a mermaid tail to play dress up). Can;t wait for the story, she must have been sooo happy! First of all, let me say that I’m so happy for your girl! Second, thanks for this awesome idea! I brought my little guy as a test to the local children’s theater production of Peter Pan, but it was too loud and too dark, and we didn’t stay for long (a bit disappointing since we shelled out 50 very hard to come by dollars to give it a shot!). Anyway, I don’t know that the people here would be as accommodating, but it’s definitely something to keep in mind. Great, great idea! Of all the things to be obsessed with, Godspell seems like a fantastic choice to me! Ahhhh, wonderful idea. Can’t wait to hear about it! DONT LEAVE ME HANGING TILL AFTER TURKEY DAY!!!!!!!!! this is just, hands down, the coolest thing that has ever happened. all the way, for real. not only is the how happening, but they’re letting you guys hang out during a thinly-peopled rehearsal…really great. can’t wait to hear news. that little one, she will be in godspell heaven! pun intended! You totally have me in tears…I feel your excitement…I can’t wait to read the next part! all, i can’t thank you enough for sharing in this experience with my family. for knowing what it means, for joining in our excitement. it makes – as i say on diary’s about page – it all so much sweeter for the sharing. SC ~ Moments like that are precious! I am amaze when people GET it. not give dirty looks oq rude comments. MKZ ~ Will you be investing in the Broadway revival? MM ~ Wow!! The music from Godspell is very powerful!! I hope she soaks it allllll of and loves every minute of it!! RBT ~ Fantastic! I am so happy that Brooke was able to see Godspell and can’t wait to read Part 2. What an amazing production team — is skywriting a big “Thank You” over the theater too much? Going home to Jesus and four Marys (perfect ratio). Ain’t nothing wrong with that girl!